Goa, a solitary Portuguese outpost in India for nearly 500 years, Goa is the hottest beach destination in India. Swaying palm trees, shallow waters, perfect sun-kissed beaches with white sands, wild beach parties, easy-going people, and exotic ‘east meets west’ cuisines, Goa has something to offer to everyone. A city that is immersed in the partying mood throughout the year, Goa is a beautiful beach city in the western coast of India and is bounded by the Arabian Sea. 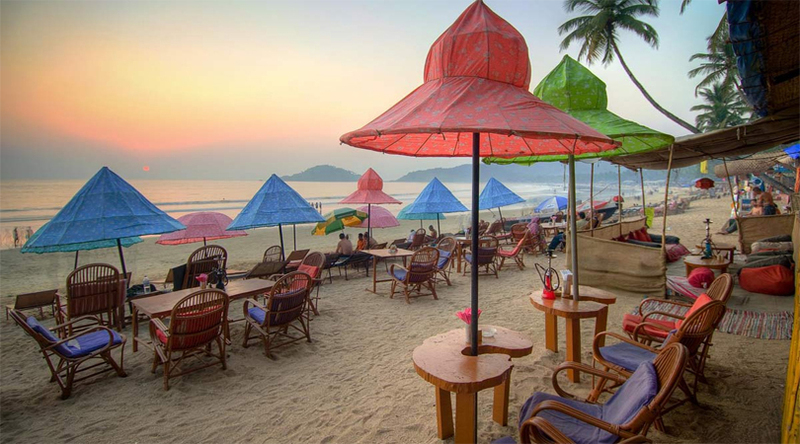 Nowhere else in the nation, you will find the laid-back slumber atmosphere that you’ll find in Goa. It is the city of fishers, party goers, beach lovers, and simple yet happy-living people. The city has its own unique holidaying characteristic and vibe. All that one has got to do is get a grab for it and then flow with it. Best known for its sun-kissed white beaches, Goa is the venue for many beach parties, water sports, and events. There is more than a dozen of beaches in Goa, and the most popular ones include: Arambol Beach, Anjuna Beach, Palolem Beach, Morjim Beach, Candolim and Sinquerim Beaches, and Calangute Beach. There are hardly times when these beaches are not crowded. Seeing people basking the sun at the beaches, taking a walk besides the shore, and surfing and swimming in the sea, is often a sight. For the Adeline junkies, the beaches are the venues where they can find a number of watersport actions. The shallow water at the beaches is ideal for swimming. Besides, these beaches are also known to create some of the most ideal waves for surfing, jet skiing, and boating. No doubt, Goa is most known for its best-in-the-nation parties, beautiful beaches, cheap alcohol, and laid-back attitude. But, there is far more to discover in Goa than aforementioned. The city is an ideal opportunity for those who have an interest in architecture, history, and religion. The city houses some of the most revered and ancient religious sites. Breathtaking Portuguese churches dot the city, all over. Bom Jesus Basilica is one of the most oldest and revered churches in the region. Built in 1605 it consists the mortal remains of St. Francis Xavier. Besides being a venue for worshiping, the church is also known for its unique baroque architecture that is studded with gold, wood, stone, and granite architectural art pieces. The other divine churches in the city include: Se Cathedral, Church of St. Catejan, Church of St Francis of Assisi, and Church of Our Lady of the Immaculate Conception. In addition to these, a couple of places in the city that you shouldn’t miss at any cost include: Goa State Museum, Goa State Museum, Kala Academy, Central Library, Christian Art Museum, The Xavier Centre of Historical Research, Goa Chitra Museum, Sri Mangesh temple, Anjuna flea market, and Butterfly Conservatory Of Goa etc. Additionally, while you enjoy your tour of the city, don’t skip out to gusto the mouth-watering Goan cuisine and relish the genuine hospitality of the state at the best hotels in Goa. One additional thing that one can be certain about Goa holiday is that arriving at the city will be an easy task. There are frequent direct Delhi to Goa flights on a daily basis, and flights from Mumbai, Bangalore, Chennai, Kolkata, Lucknow, and Varanasi etc.